iPod Explorer gives you complete access to all the music and video stored on your iPod, your music can be accessed from any application, or dragged onto most media devices such as MP3 players, mobile phones or iPods. Once you start up iPod Explorer, you can access all your music from the iPod Explorer hard disk that will appear under Windows. This means to access your tunes, all you need to do is select 'File Open' in your favorite application. Once you start up iPod Explorer, you can access all your music from the iPod Explorer hard disk that will appear under Windows. This means to access your tunes, all you need to do is select 'File Open' in your favorite application! * Access your music from any Windows program. * Drag and Drop Songs, Playlists or Video to other iPods, or devices like MP3 Players or mobile phones. * Drag your music back into iTunes. * Move entire genres, albums and artists.Converts songs automatically to .MP3 format. 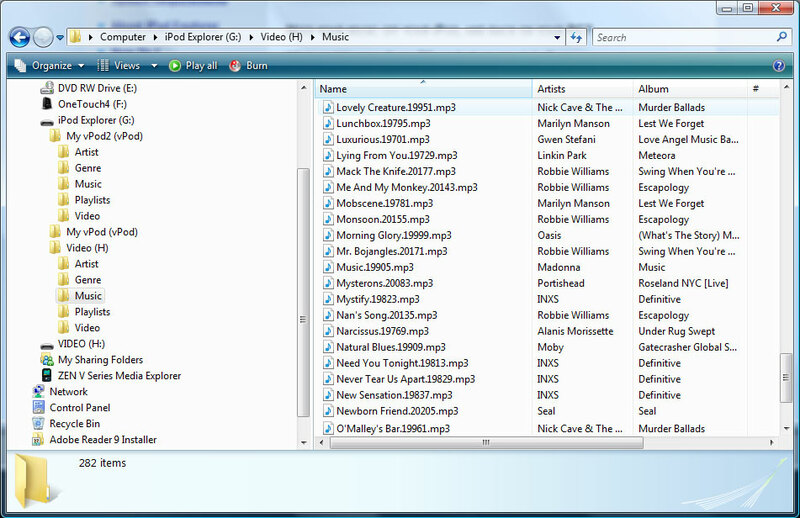 * Use standard windows search features to quickly locate your music. * Cue up music on your iPod within Windows Media Player or Winamp. Qweas is providing links to iPod Explorer 4.0 as a courtesy, and makes no representations regarding iPod Explorer or any other applications or any information related thereto. Any questions, complaints or claims regarding this application iPod Explorer 4.0 must be directed to the appropriate software vendor. You may click the publisher link of iPod Explorer on the top of this page to get more details about the vendor.